Many years before insulated ceiling tiles first appeared on ceilings, many homes featured plaster, beadboard or drywall ceilings. These rigid surfaces were high-maintenance. This was especially true with plaster and the early editions of drywall that tended to crack from the stresses of the home's structure. High-end homes at the turn of the 20th Century may have used tin, copper or another stamped metal along with plaster moldings. Today, most ceilings are sheathed with painted drywall but insulated ceiling tile is making progress as a popular ceiling. The wide variety of designs, colors and shapes have lifted them out of the utility rooms and into the living areas of the home. In fact, many ceiling tile models are paintable and molded into designs that mimic the best in authentic Victorian ceilings. All ceiling tiles are not the same. Some styles are stapled to rows of two-inch wood strapping arranged in lines, about ten inches apart, on the ceiling. Some kinds are simply fastened to the ceiling itself. However, most of the insulated ceiling tiles installed in homes and businesses are inserted into a T-grid, suspended frame that hangs from the ceiling. This is most commonly termed as a "drop ceiling." Besides being easy to install, a ceiling tile drop-ceiling grid with insulated tiles absorbs sound making it a good acoustic barrier between floors. The space above is also perfect for hanging electrical conduit, plumbing and HVAC ducting, which is easily accessed for maintenance. In most building projects, the space between the original ceiling and the frame is used as a plenum for returning cold air. The tiles fit snugly into the T-grid frame for consistent air pressure. Closed-edge insulated tiles usually have an inner foam core surrounded by a mixture of resin and fiberglass, which molds to a rigid form. Unlike the regular insulated tiles, closed-edge tiles are sealed off and impermeable to moisture and other contamination like airborne grease and dirt. The sealed panel can take a 40-pound load capacity so they are incredibly strong. Many decorative tiles are the closed-edge type for a better fit in suspended T-grid ceiling frames. This is not to say that you should ignore insulation in the attic. Without attic insulation, a home homeowner would have to stack many tiles to get close to R-40, the recommended insulation protection required with R-2000 homes. However, they are the icing on the cake and can prevent heat or HVA-cooled air from penetrating the ceiling. Ceiling tile installations require accurate planning and measuring, much like figuring out a floor tile design. A regular dropped-ceiling uses a grid-work of metal channels each shaped like an upside-down "T." These channel are suspended by on wires fasted to the overhead structure and angle channels are attached to the walls at the proper level. They can also hang from pipes or other suspended parts as long as the grid is completely level on all walls and there is a space of about one foot in order to maneuver the tiles into place. The channels easily snap together in a pattern of two-by-two feet or, in most commercial settings, two by four feet. In many cases, they cut the tiles to fit in narrow channels near the wall. 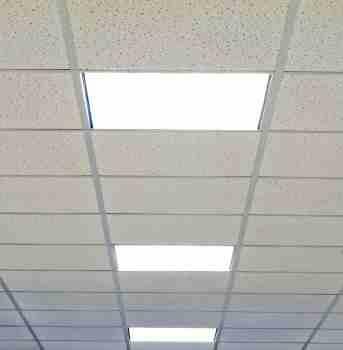 One of the best ways to get a ceiling tile grid perfectly level is to rent a laser leveler from a tool rental place. The red line marks the wall where to place the angle channel and the T-channels are measured off these. Installing insulated tiles is not a good do-it-yourself job if the homeowner has never attempted one before. A good place to start would be a small washroom. This would enable the homeowner to get his or her feet wet before tackling a large room.